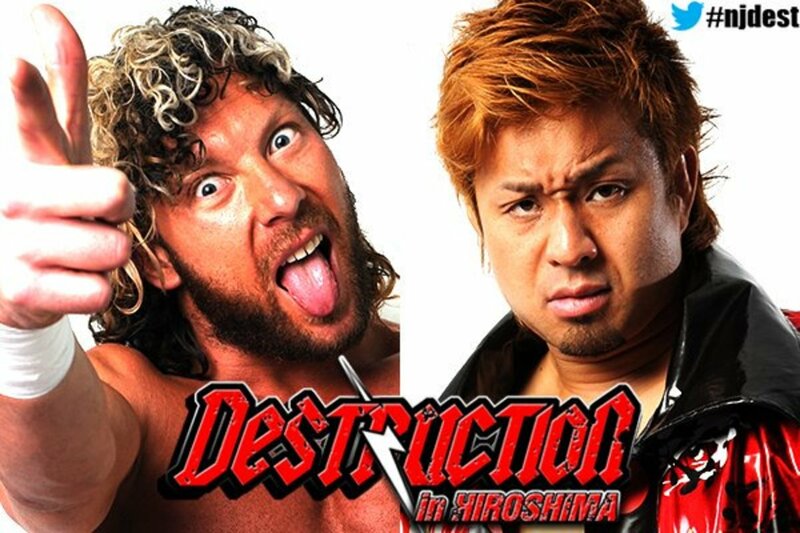 Thursday morning marked the second big NJPW show this month, Destruction in Hiroshima. It’s a bit more in-depth than the show in Kobe, with YOSHI-HASHI seeking to take Kenny Omega’s IWGP title shot, Adam Cole defending the ROH World Championship against Will Ospreay, Kazuchika Okada facing Bad Luck Fale in a G1 rematch, and The Briscoes defending their IWGP heavyweight tag titles against The Young Bucks. One of the announcers said that Shibata is off the rest of the tour due to injuries. Also, due to travel delays, Matt Sydal is not on this card either. Okay opener. Mostly just a continuation of the story between Captain New Japan and Yoshitatsu where CNJ constantly loses and Yoshitatsu is growing tired of it. Yoshitatsu now has more reason to be upset as CNJ again cost his team the match, this time eating a lariat from Kojima. For some reason Nagata’s music is dubbed again even though as recently as last week it wasn’t. Nakanishi totally missed a plancha on O'Reilly that looked embarrassing, he landed on the floor hard. Beyond that spot, perfectly okay tag match ending when reDragon pinned Tiger Mask after Chasing the Dragon. Started off with Baretta doing a huge dive, wiping out both Tonga and Loa. It’s easy to see why doing the mixed tag divisions would make a whole lot of sense as even though the Guerillas of Destiny are bigger it’s not by much. The two teams worked well with one another, though by far RPG Vice came off as more over in general. Tonga went for a gun stun at one point but Romero blocked it with a roll-up. Tonga got a second one and pinned him with the Guerilla Warfare (assisted double arm DDT). Solid match. Yujiro brought out two women in bunny masks whose outfits left very, very little to the imagination. Owens actually hit the package piledriver on Goto for a near fall. Ishii helped him get things back together, with Goto hitting the ushigoroshi and Ishii hitting the sliding D lariat. Goto followed with the GTR and pinned Owens for the win. Pretty good match towards the end. No sign of the mysterious Ingobernable that’s been lurking about LIJ matches as of late. They took out Elgin in an angle early on in the match by having LIJ jump him, laying him out on the stage, and hitting him with a steel chair on the leg they’ve been targeting during this entire tour. Staff took him to the back as the match continued. After a while, Elgin came back and made a hot tag, beating up Naito. This gained momentum as time went on, with a great exchange between EVIL and Elgin that kept going until Elgin got the win with the sit-out powerbomb. Naito tried to jump Elgin immediately after the bell rang but he stood his ground, powerbombing Naito. KUSHIDA and BUSHI went at it as well, with KUSHIDA making it very clear that he wants another shot at the title down the line. Good, solid match. Not out of this world, but a lot better than other recent heavyweight tag team title bouts. Briscoes were wearing bizarre trunks that I guess kind of looked like camouflage grass or something. It was really weird, but kind of fit them at the same time. It was mostly a good back and forth match to start -- Bucks would get some momentum, but Briscoes would cut them off, and so on. Matt floated over a Doomsday Device and the Bucks hit some superkicks. Briscoes came back following a failed Meltzer Driver attempt, with Jay laying out Matt with the Jay Driller. Briscoes laid out Matt with a space mountain/cutter combo from the top rope but he still kicked out. Briscoes then hit the Doomsday Device and got the pin. Guerrillas of Destiny came out and laid out the Briscoes with the belts after the match. Tonga cut a promo saying this belongs to GoD. This is our territory. Japan belongs to Bullet Club, and GoD wants a rematch. This isn’t a feud I’d continue. This was good, but the crowd was pretty much dead for it. Probably would have come off as a great match if they were into it. Nice back and forth to start. Ospreay hit the big Sasuke Special to the floor. Cole tried to gain momentum but Ospreay cut him off and hit a standing corkscrew. Cole hit a backbreaker to get back in the match. Ospreay countered a suplex into a stunner in a pretty cool transition spot. Ospreay hit the corkscrew punch and tried the cutter but Cole countered. Big back and forth which resulted in Cole hitting a running knee. Cole charged to the corner but Ospreay superkicked him. Ospreay went to springboard again but Cole countered, hit a Canadian Destroyer from the middle rope, then pinned Ospreay with the Last Shot (a suplex into the knee) for the win. Good match. Fale is really limited, but Okada has had good to great matches with Fale before and this one was no different. They played their roles perfectly, with Fale being the big monster who was super tough to beat while Okada fought against the odds to win. Okada tried to bodyslam Fale early on the outside but Fale countered and bodyslammed him instead. They brawled on the outside, with Fale choking Okada with his foot on the guardrail. Yujiro then appeared and and started to freely interfere. Fale gained control of the match while Okada started favoring his arm. He hit a back body drop. Okada tried to pick up Fale, but couldn't until Fale missed a charge and recoiled back to Okada. Fale made a comeback and tried for the Bad Luck Fall but Okada escaped and hit the dropkick. Okada tried for the Rainmaker, but Fale came back with the lariat and the Grenade but Okada kicked out right at 2.9. Fale went for something on the top rope but Okada slammed him back to the floor. Yujiro interfered but Okada cut him off and tried for the the Rainmaker, but it didn't connect all the way. Fale grabbed him for a Grenade but Okada countered and tried another lariat, but it didn't connect with the giant Fale. Okada escaped the Bad Luck Fall again and hit a dropkick. The tombstone followed, then the Rainmaker, and that finally clinched it for Okada. Omega and YH made it out to the floor early where Omega took out the mats. He teased piledriving YH on the exposed floor but YH countered with a back body drop. This is where the Young Bucks came in and interfered, spraying hairspray in YH’s eyes. YH wound up on the barricade where Omega landed a moonsault, sending them both into the audience. Omega worked him over until YH managed to cut him off with a neckbreaker, but Omega came back and tried to use a trash can. Of course, The Young Bucks conveniently distracted the ref and shoved him to the floor, and assisted Omega in spike piledriving YH through the trash can. With YH down, Omega tried to go for the One Winged Angel but YH countered with a DDT. He started to make a comeback, hitting the double knees on a seated Omega for a near fall. He locked in the butterfly lock, but Omega escaped. Omega missed a moonsault that allowed YH to hit a tombstone and a knee strike to the head for another near fall. YH tried for the swanton bomb but Omega got the knees up. Omega hit a German suplex but YH immediately got up as the crowd popped. Some hard slaps were exchanged as the crowd got into it. Omega walked right into a YH lariat. YH went to the top rope but Omega met him there. YH countered with a powerbomb into a cover but didn't get the win. Hirooki Goto came out and challenged Omega after the match. There’s intrigue to that, since an Okada/Goto main event would be interesting, but Goto lost clean in the finals. Why would Omega accept the challenge? What would he have to prove? Omega cut a promo after the match, saying that he admires YH’s heart but he still did the J-double-oh-B. He called Goto “Goto Hell." He wants to stand here and challenge him when he beat him at the G1? He asked the fans if they wanted the match. They cheered, which caused him to say “Goto Hell” again. He said he’d think about it. This was better than the Tokyo show in terms of name value and match quality. Nothing here was absolute must see, though the main event was the best match out of either show so far. Some booking directions going later into the Fall seem pretty flat, in all honesty. There’s no reason for Goto to challenge Omega and just when you thought the tag titles were going in another direction, everything returns to normal immediately. Kind of lame, but it might all make sense in the end given Gedo’s booking.